Do you know who makes your cat toys and cat beds? At Cat Faeries we can tell you exactly who made our beds and cat toys. For multiple reasons we do not support manufacture in China, including that items are loaded with pesticides from being fumigated on the ship and possibly treated with formaldehyde in the factory, not to mention near slave conditions at many facilities. Our beds are made in a small factory in California by workers who have worked there and participated in decision making for years. Our toys are made by the person we lovingly refer to as The Toy Elf. The toys and beds are cut and sewn by hand. Everyone works in conditions that are either in their home or in a well-lit and ventilated factory with normal business hours. Everyone makes a living wage. Everyone cares about your cats and cares about you. This video (https://www.youtube.com/watch?v=gHS5zafY0NY) is about clothing and was produced by model and activist Amber Valletta and she gives the opening introduction to set the mood for what’s to come. Christie Turlington Burns, another model and activist also speaks, as do some pioneers in the world of fashion who are saying no to horrific working conditions for clothing. If you wear clothes (and we think that you do!) you need to watch this and share it with friends and children. We were sent the story of a rescued cat named Hailey submitted by her Foster Cat Mommy, Kim who certainly knows who made their cat toys and their cat beds! We have hidden the photo behind a link because it might be upsetting to sensitive adults and children (link to photo – http://www.catfaeries.com/images/newsletter/2016-04-26/hailey-800.jpg). 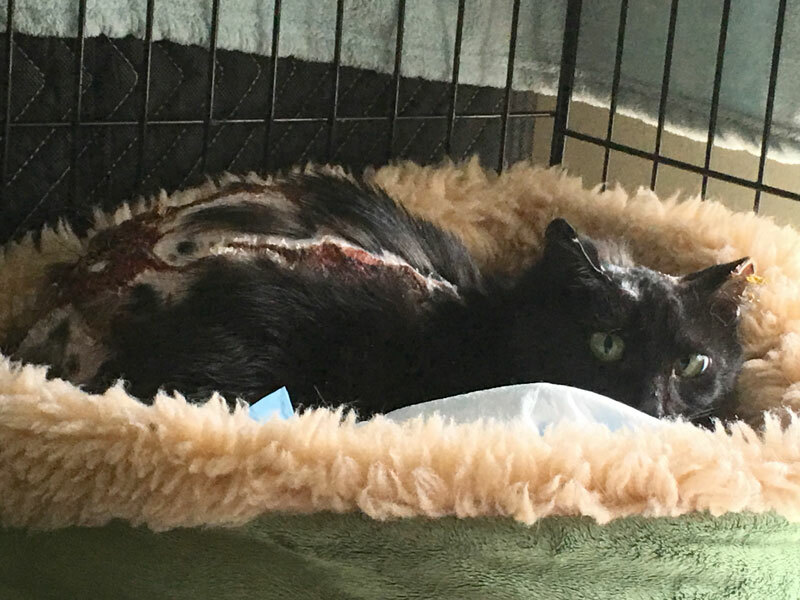 Hailey the cat is recovering from a severe burn from the hands of abusers and you can see in the photo the very long wound on her back. She’s shown inside a cat crate for quiet and privacy while she recovers and gets used to her new forever-home in the comfort of one of our beds and with a catnip mouse nearby. I just wanted to send you this pic and thank you for your marvelous beds. Hailey is a feral that someone abused and burned with what the vet thinks may have been hot oil. I am providing her care and know that I will end up adding her to our kitty family as she cannot be returned. She was so frightened when I brought her home but instantly found comfort in the cat faeries’ bed. Today I put a Cat Faeries mouse in her crate. Hopefully it will be a little treat for her. Also using a bit of the Convivial House Cat Spray around her crate which is still covered. Thanks again for your products.